Fall season is in full swing and we will soon notice cooler temperatures and perfect weather to go outside and be active. Beware that fall not only brings climate change, but a wildlife change as well. Yes, this is the season to watch out for wild animals. It could be too easy for your dog or cat to get close to wildlife and contract a disease like rabies. Many pet owners are not aware of rabies and what it can do to our pets. Below is important information for pet owners about rabies. What is rabies? Rabies is a disease that can be easily passed in pets, humans, wildlife and even livestock. The disease attacks the central nervous system (the brain and spinal cord), and is most commonly transmitted through saliva. What wildlife animals are known to have rabies? 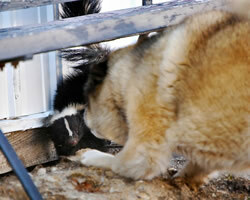 Raccoons, skunks, foxes, bats, jackals, mongooses, feral cats and wild dogs are the most common carriers of rabies. Will I know when a wild animal has rabies? Sometimes yes and sometimes no. It is very important to remember that wild infected animals may not always show symptoms of rabies like aggressive behavior, confusion, or excessive anxiety. The disease can be asymptomatic. Can I get rabies? Yes. The disease can be transmitted to humans. Almost every case of rabies has come from a bite by a rabid animal. Can I vaccinate my pet? Yes. There are several different vaccines for your dog or cat. All pets should be vaccinated between the ages of 12-16 weeks old. If you plan on traveling internationally all rabies free countries and countries with low incidence of rabies require a rabies vaccination. Rabies isn’t the only disease to watch out for this fall. Many people don’t know that just one bite from a mosquito could transmit heartworm, a serious and often times deadly parasite to your dog or cat. Also, flea and tick populations often increase around this type of year. This season brings all sorts of opportunities for infection, sickness, and disease for which every pet owner should be aware of. If you suspect your pet has been exposed to a disease, do not hesitate to contact your veterinarian right away. Mick – you can find requirements to import your dog to Bosnia here: http://www.pettravel.com/immigration/Bosnia_herzegovina.cfm. Know that if you plan to return to the UK, your dog will need a titer test 90 days before returning. You can find UK regulations here: http://www.pettravel.com/immigration/UnitedKingdom.cfm.